I always present approaches, people and organizations that are Honest, Moral and Ethical, the kind that can help anyone Be, Do and have all they want in life. That is why Joe and his work loudly spoke to my mind and soul. In an interview with Natalie Pace of Huffington Post, Joe describes more about BAM philosophy , and how others can achieve greater success in their own lives and careers. Natalie asked Joe a key question: It’s one thing to say “BAM!” and another to turn a losing team into winners. How did you inspire that turnaround in just two years? Are they receiving extra help? Are you bringing in extra resources? Remember: We did the same thing in the business world. It was the exact same philosophy. You have to implement a plan. You have to implement a strategy. You have to have a mission. Most people’s mission in the business world is, “We want to be the best blah blah blah at whatever we do.” At Ameritrade, our mission was that we were going to bring financial literacy to everybody in this country. It was aspirational. But it also wasn’t about us. It was about our clients. Our mission at Coastal Carolina is that we’re going to put a team on the field that anyone associated with Coastal is going to be proud of. While winning is an important part of that, it also means that you never, ever, ever take the play off. You always give it 100% of everything you have. This is not just football. This is in the classroom. We have incredible resources to help our athletes at Coastal. But if the guys are not even going to class, we don’t want them to use those resources. They’ve got to go to class. They’ve got to live up to the responsibility and we’ll do everything we can to help them. As I have often said, if you want to be a leader you have to know how to follow … If you want to have a friend you need to be a friend … If you want to be a teacher you need to learn how to study. Joe walks the walk at the same time and in the same way he asks his players to, empowering the players to led themselves. His life is a living model of the principles I demonstrate. 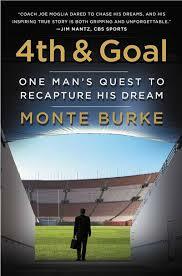 Joe is the real-life inspiration for the Monty Burke book, 4th & Goal: One Man’s Quest to Recapture His Dream, and garnered national media attention by the likes of Fox News, CNBC, MSNBC, FoxSports.com, ESPN Game-day, ESPN.com Grantland Series, Associated Press, The Sports Network, Yahoo.com, Yahoo!Sports.com, Esquire, USA Today, Wall Street Journal and CNNRadio.com. Success leaves tracks. So follow them. Joe has been a national coach of the year finalist in each of his first three seasons — finishing runner-up in 2014, the Big South Coach of the Year twice and the American Football Coaches Association Region 2 Coach of the Year once. In just a few short years, he has taken his program to the FCS elite. Wonderful examples of proven success are all around us. Joe Moglia is one of those trend setters that I will be paying more attention to, and learning from, as I work to inspire, uplift and serve all people with whom I come in contact.